Adaptec produce an extensive range of S.C.S.I. host adapters for the P.C. environment. All major bus types can be accommodated, as well as all recognised S.C.S.I. standards. Two basic approaches to data transfer are taken when dealing with S.C.S.I. devices on a PC, Programmed I/O (PIO) or Bus Master. Programmed I/O is the cheaper and simpler solution. The PIO approach is very similar to the method used for data transfer with I.D.E. (ATA) Hard Disk Drives. The penalty is reduced processor performance, since all data I/O to a S.C.S.I. device requires the direct attention of the processor. PIO is usually quite satisfactory on single user machines. Bus Master handles data transfers from S.C.S.I. devices using D.M.A., (Direct Memory Access) freeing the processor from this task. Bus Master produces a substantial improvement in system performance, and is recommended in data intensive systems, such as file servers. To ease installation and operation, Adaptec also market a range of S.C.S.I. support software for the P.C. Adaptec EZ-SCSI is a high performance, easy to use support package for the entire range of Adaptec Host Adapters. 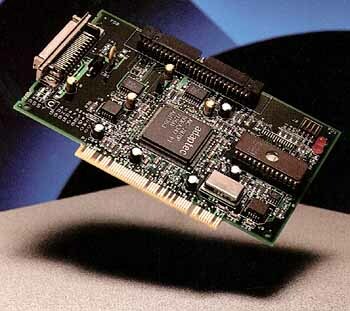 Adaptec products are also available for SCSI-Differential, Apple Macintosh-PCI and RAID. Please contact ZCM Services for detailed information and pricing.